England’s hopes of a first Six Nations title since 2011 were dealt a massive blow after Gael Fickou’s last-gasp try gave France victory in Paris. Stuart Lancaster’s men produced a scintillating comeback from 16-3 down to be leading 24-19 with just four minutes remaining but the late French try has seen their odds drift out to 9/2 from 9/4 to win the tournament. 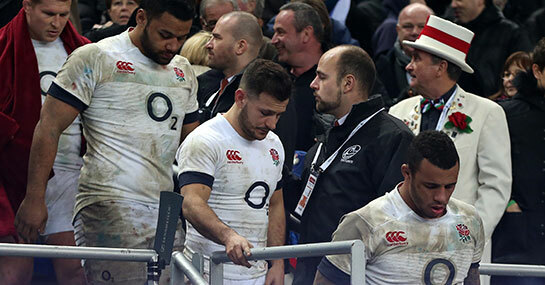 With a trip to Murrayfield to face Scotland next, nothing but a win for England, who are 5/2 to win the Triple Crown, will do if they are to lift a trophy at the end of the campaign. Meanwhile, France, who have won the Five or Six Nations every year after a British and Irish Lions tour in the professional era, are the new 15/8 favourites to win the championship after victory over England. Les Bleus finished bottom of the table last year but are now on at 9/2 to record their first Grand Slam since 2010, which came after the Lions Tour to South Africa. Meanwhile, Wales began the defence of their crown with a workmanlike 23-15 win against Italy in Cardiff. Warren Gatland’s side are bidding for an unprecedented third straight Six Nations Championship and they are still 2/1 with Ladbrokes to retain their title. With trips to Ireland and England to come a Grand Slam looks a tough ask for the Welsh but after victory in week one they are now 5/1 from 6/1 for another four wins. Elsewhere, Ireland eventually ran out comfortable winners against Scotland in Dublin. Joe Schmidt’s side were hit by the late withdrawal of talisman Paul O’Connell at the Aviva Stadium but the captain is expected to return for his side’s crunch clash with Wales. The Irish are 10/3 with the bookmaker to win their first title since 2009, while Scotland’s price to finish bottom of the table has shortened to 5/4 behind 4/6 favourites Italy. Six Nations Week Two Fixtures: Ireland v Wales (Sat 14:30 BBC One), Scotland v England (Sat 17:00 BBC One), France v Italy (Sun 15:00 BBC One).